Anybody able to assist with this? voss qa added a comment - 2015-08-11 05:42 Anybody able to assist with this? TestNG plugin states that 1 from 1 TC passed, but the TestLink plugin results show a 'Not run'. The testng-results.xml file is OK, shows that the TC passed. Somehow Testlink does not confirm this result. Could it be that the TestLink plugin wants to retrieve the test results before those are written out in the xml file, setting it to 'not run' as a default? Arne Wohletz added a comment - 2016-07-05 12:24 I have a similar problem. TestNG plugin states that 1 from 1 TC passed, but the TestLink plugin results show a 'Not run'. The testng-results.xml file is OK, shows that the TC passed. Somehow Testlink does not confirm this result. I also use a 'TestNG class name' result seeking strategy 'Include pattern' = target/**/testng-results.xml and a 'Publish TestNG results' post-build-action: TestNG XML report pattern = target/**/testng-results.xml I am currently learning from this tutorial: https://wiki.jenkins-ci.org/download/attachments/753702/jenkins.pdf TestLink v1.9.14 (Padawan) TestLink Plugin v3.12 TestNG Results Plugin v1.13 Jenkins v1.651.3 Can somebody help? Could it be that the TestLink plugin wants to retrieve the test results before those are written out in the xml file, setting it to 'not run' as a default? > Could it be that the TestLink plugin wants to retrieve the test results before those are written out in the xml file, setting it to 'not run' as a default? 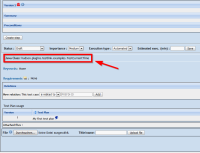 By default, for each test case retrieved for the given test plan, the status is set to not run. Then it will use the strategy you chose to search for test results. For JUnit, it uses Jenkins' JUNit parser. For TAP, it uses tap4j. So it would require investigation to define whether there's something wrong with the parser, if the configuration is correct, of if it's a bug or incompatibility in the Java and/or PHP layer. thanks for for quick response. I found the solution which works for me - the class name that is used in the example is actually 'jenkins.plugins.testlink.examples.TestCurrentTime' whereas in TestLink I used 'hudson.plugins.testlink.examples.TestCurrentTime' as it said in the tutorial PDF (page 15). Maybe that also helps voss qa. Arne Wohletz added a comment - 2016-07-06 08:03 Hello Bruno, thanks for for quick response. I found the solution which works for me - the class name that is used in the example is actually 'jenkins.plugins.testlink.examples.TestCurrentTime' whereas in TestLink I used 'hudson.plugins.testlink.examples.TestCurrentTime' as it said in the tutorial PDF (page 15). Now it works perfectly! Maybe that also helps voss qa .